icy wrote: Earlier tonight I started reading A Fine Balance by Rohinton Mistry. The longest book I've picked out in ages. Just finished it. Ouch what an ending, parts of the book moved me to tears but it sure was a page turner, and it will stay with me for awhile. Next up Departures by Lorna J. Cook. ETA~And I end up winning another book . After the rather light-hearted read of a Grisham novel and the 50 Shades of Grey annoyance I think it was time to have some highbrow read. I looked at the unread books in my apartment and decided to give Siri Hustvedt's latest novel, The Blazing World, a try. Quite fitting, because after Fifty Shades of Grey, which advertises women being submissive, Hustvedt's novel is a feminist novel par exellence. Sounds very interesting! Thanks for the POV. What are you reading at the moment? How do you decide what you read? Do you read more than one book at the same time? Prep by Curtis Sittenfeld. About life in a boarding school over a 4 year span. Depends on my mood in deciding what to read. I would love to read a light hearted book next, but I don't have any. Just the one book at the same time. Not sure how Prep will end, can't even guess at this point. It keeps me reading on, mark of a good book. Writing On My Forehead by Nafisa Haji might be my next read or Benediction by Kent Haruf. 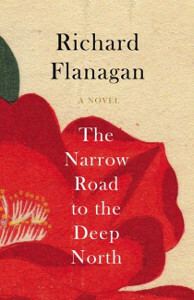 Richard Flanagan's Norrow Road to the Deep North is about Dorrigo Evans, an Australian medical doctor in the middle of the twentieth century. He becomes a prisoner of war in Japan and is responsible for medical care for the POWs during the building of the infamous Burma Railway. Even though Evans is at the heart of the novel, the railway building and especially the war crimes are at the centre of this book. It begins almost light-hearted with Evans desparately falling in love with the wife of his uncle. She is with his thoughts even during the sheer violence during the war, even though he does not admit it. The novel takes place before, during and after the atrocities of the railway building. Quite a disturbing novel which is Booker Prize winner of 2014. The second part is probably the strongest part of the book. The descriptions Flanagan offers are as horrible as what we have heard about the holocaust. (The images you can find of the POWs stress this comparison). The parts after this follow the fates of the main characters (both POWs as well as commanding Japanese and Korean soldiers). But executions and deaths of cancer etc are no comparison to what horrors the POWs witnessed in Siam. The fact that 'love' is probably the strongest theme of this novel makes it all the more disturbing.Pretty heavy stuff. Next up the 2013 Booker Prize winner The Luminaries by Eleanor Catton. On my wish list thanks, his other books look to be intriguing as well. Prep was an intriguing book, I wish there was more to the ending, especially about Lee's family and her life after boarding school. I felt there was more about her school mates than her own life at the ending. I recently purchased Shantaram by Gregory David Roberts, Harper Collins paperback edition with 933 pages. Might be a summer read. Right now reading Benediction by Kent Haruf. Already quite thought provoking. About a man who has cancer, isn't wanting treatment, and lives of his family. It makes me think of my Uncle and Aunt who were together for over 50 years, before he passed away from cancer over 5 years ago. After this, I might just read a Nicolas Sparks book. The guy can get crap for his books, but I truly enjoy them. Benediction looks interesting. Thanks for the info. Interesting to see what you are reading. Looks like you focus a lot on postcolonial literature? Read the first couple of pages of The Luminaries today. It already grabbed me. Amazing style of writing. Although I feared starting it a little as it is over 800 pages long I am pretty sure this will be a quick read. Excited! Simon wrote: Benediction looks interesting. Thanks for the info. Interesting to see what you are reading. Looks like you focus a lot on postcolonial literature? I do. I loved and still love Molokai, another recent book I read. During Christmas I read Baltimore's Mansion, a compelling memior. There is no telling what book will take my fancy, but I like to be surprised. Not sure what to make of Benediction just yet, it goes back to the past, and to the present time in Dad Lewis's life and the members of his family. It reminds me of some of myfamily members, cause I know illness can bring out the best and worst in people. I'm wary about what will happen next though. I hope things can be put right. Nearing the end of Benediction, and I'm bawling my eyes out. ETA...completed. Will post my thoughts later...maybe. I fear books longer than 500 pages, the 700 pages mark makes it almost impossible for me to commit to reading it. Since I am currently working on a project about the Booker Prize, I bought and read Catton’s The Luminaries with whopping 832 pages, the longest book ever that won the award. Thank you very much. Finished it today and I can say it is truly one of the best books I have read in ages. What is it about? In the 1850s, Walter Moody enters the smoking room of a hotel in New Zealand in the middle of the night. He has just arrived in Hokitika, the current centre of New Zealand’s goldrush. Moody is tired and hopes to find solitude and quiet in the smoking room. But it soon becomes clear that his arrival has interrupted some dubious meeting in the smoking room. After a while it becomes clear that a light-hearted talk with a guest turns into some kind of interrogation. And is it just his imagination or are the other people listening to his answers? As it turns out, several strange things happened in Hokitika in the last days. A dead hermit, a whore who allegedly attempted suicide and does not remember anything, the richest golddigger in Hokitika has vanished all of a sudden. As it turns out, all 12 visitors in the smoking room have a story to tell that are somehow intertwined. And to top it, Moody has witnessed a horrible incident aboard the ship that brought him to the town. And that story might be the missing piece of the puzzle. As I have stated earlier: The book grabbed me pretty soon. The atmosphere is dark and mysterious, the storytelling successfully imitates authors of the Victorian Age, Hardy, Dickens and the like. Each sub-chapter starts with a succinct summary which reveals the continuation of the narration and advertises the chapter and keeps you reading because you WANT to know how the story evolves. The structure of the novel imitates a decrescent moon: 12 main chapters of which the first is the longest and the last the shortest. Overall, the story uses astrological elements that are imitated by the characters. Thankfully, this is not done in your face-style. If you like, you CAN follow these imitating movements of planets by characters, but you can ignore them and still enjoy the novel. I like novels with many protagonists, and this novel easily succeeds in developing each of the 15 characters (or more) to distinguish, like, love or despise. And since every character is connected to all the other protagonists, it never gets boring to witness their interactions. Especially because the novel has so many elements. A little bit of Canterbury Tales, a little bit of Sherlock Holmes, some John Grisham, Western atmosphere, some Edgar Allan Poe. (But no 50 Shades of Grey, nor Lord of the Rings stuff… or is there?). Don’t be afraid of the 800 pages! If I can read them in 10 days or so, so can everybody else. 10 days?! Wow! That's incredible, and so is your views on it. I have you thank once again, you have opened my eyes to historical books. It's a genre I probably never would have picked without your input/info on what you read/post here. Many thanks! I recently tried to plow through Until I Find You by John Irving. It dragged on and on IMO. I couldn't finish it, partly because grief got in the way. Not the best book to read at the best of times, let alone during losses. I can't bring myself to finish it, even now. Right now I'm reading The Heart Is A Lonely Hunter by Carson McCullers. Already an eye opener. Thanks Icy. But it's just 80 pages a day. Not that impressive. And since I leave for London in a couple of days I wanted to finish the book, as I did not want to carry with me that tome . And yes, historical books can be very entertaining, biographies or novels. And after all, this is just taking place 150 years ago. Sorry to hear that Irving's novel did not grab you. But I had a similar experience with Hotel New Hampshire. At one point I was so annoyed that I threw it against the wall and never picked it up for reading again. Even though Queen were about to record a soundtrack for the film. Even the many utterances of "Keep passing the open windows" did not help. The Heart Is A Lonely Hunter sounds interesting from what I read on Wikipedia. Curious about your verdict.